If you were around for New Jack Swing, remember buying CDs in actual music stores and consider the 90s to be an era of R&B abundance, then you were likely a fan of the female trio SWV. With their fun and flirtatious uptempos ("I'm So Into You," "Anything," "Right Here," "You're The One") and sugary, sensual ballads ("Always On My Mind," "Weak," "Rain," "Use Your Heart"), NY natives Leann Lyons (LeLee), Tamara Johnson (Taj) and Cheryl Gamble (Coko) were some of the decade's most popular and successful performers, selling over 20 million CDs on the strength of their air-tight harmonies and around-the-way appeal. However, as the 90s ended, so did the camaraderie, due to sabotaging outsiders, internal anguish and the world at large positioning Taj and LeLee----the one who founded the group----in the background of Coko's foreground. Their final release of the era, Release Some Tension, did anything but, and the young women unhappily parted ways. Making snowballs in the tropics seemed more likely than the three of them ever returning to center stage. The years brought personal and professional changes, with only Coko remaining in music as a solo R&B and Gospel artist, but a lucrative opportunity to reunite for fans overseas saw the trio reconnect in 2005. Years later, after touring with musical peers like Jodeci and Blackstreet, SWV made it official with the release of their engaging and aptly-titled 2012 CD, I Missed Us, and rode the momentum into a WeTV reality show, SWV United. It was a publicity goldmine and allowed fans to relate to their adult issues, but the constant focus on industry woes and internal angst threatened their reboot. SWV untimately decided to give the people what they wanted, getting back into the studio to create their fifth studio album, Still. The cover displays three close and confident women, glammed up to the gods and hitting their strides as individuals and artists. What isn't so apparent, however, is the breakneck speed in which the music came together---one whole week. Conceived to coincide with the heightened profile of the previous reality show, Still follows the arc of their 2012 release, except there's more lead vocal sharing this time around. Taj's throaty contributions are the most distinctive of the two, prominent on the come-hither mid-tempo, "Let's Make Music," and the roller-skate-ready groove "On Tonight." LeLee's is more subdued in tone, but just as affecting on the edgy kiss-off, "Leaving You Alone" and the nostalgic bluesy turn of a ballad, "When Love Didn't Hurt." Does that switch-up mean the sound has also changed? Hardly. Their lushly layered three-part harmonies remain intact and best encapsulate the highlights of the CD. The title track is a lovestruck ode to that tried-and-true guy, recalling "I'm So Into You" in tempo and feel: "I'm so glad, that you're my guy/and we gave love a try/It's real, I hope you know that I'm still into you." "Love Song" serves up some flirtatious funk ("You got me so high, like I'm on a cloud/the way you put it down.and I just can't enough. "), and there's even a pair that give the brothers something they can feel, the adoring 'Mr-Do-Right' anthem, "Ain't No Man" and "MCE (Man Crush Everyday)," where the ladies find themselves fawning over a man's delectable pics and yearn for a closer peek.....and beyond: "Lookin' atcha pictures, wishin' I could be witcha'/Tell me how long I have to wait, baby make no mistake." 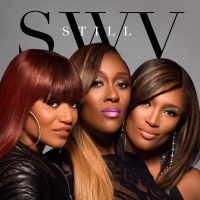 With the release of Still, Taj, LeLee and Coko proved the merit of their comeback and confimed their ability to maintain, and modernize, what SWV is all about: spinning universal emotions into infectious jams that fans recognize and relate to. 20 years and multiple peers have come and gone, but this trio of ladies keeps rising to the challenges and proving naysayers wrong yet and.....you know the rest. Recommended.